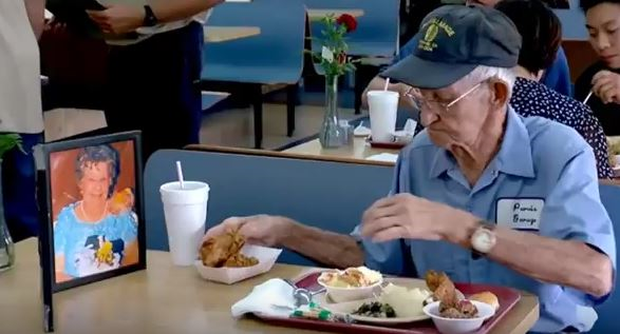 A 93-year-old widower is warming hearts in Reidsville Georgia by dining with a photo of his beloved late wife Carolyn every day. Clarence Purvis started dating Carolyn in 1948 when he was 24 and she was 16. They married the following year and spent 63 years together. In recent years they would dine together at Smith's restaurant and when Carolyn tragically passed in 2013 Clarence kept up the tradition - with her photo. "She was always with me when she was living," he told WTOC, "And she's always with me now." He added, "Ain't nobody loved one another more than me and my wife loved one another. I wanted what she wanted and she wanted what I wanted." Clarence make the trip to his wife's grave 125 times a month because he says, "I love her that much and miss her that much and I think she would with me." The owner of Smith's restaurant, Joyce James, told WTOC that Clarence is part of the restaurant and "one awesome guy". "I asked my husband, 'if something happens to me will you put my picture on the table?' and he said, 'I don't think so dear. I love you but Mr Clarence is one awesome guy.'"